Virginia Drozd planned on enjoying a relaxing vacation at sea but instead found herself fearing for her life. NBC 5’s Trina Orlando reports. A cruise ship that was the focus of a daring rescue operation off Norway's frigid North Sea coast became disabled because its engines didn't have enough lubricating oil, the country's top maritime official said Wednesday. Low oil levels were the "direct cause" of the engine failure that stranded the ship during a storm Saturday, Lars Alvestad, the acting director general of the Norwegian Maritime Authority, said. Sensors detected the oil shortage and automatically shut down the Viking Sky's engines to prevent a breakdown, he said. The ship's harrowing weekend ordeal injured dozens of people, including 36 who were admitted to hospitals. Four people from the ship remained hospitalized Wednesday, including one being treated in an intensive care ward in critical but stable condition, Norwegian health officials said. Alvestad said the amount of oil was "relatively low" but still "within set limits" as the Viking Sky neared Hustadvika, a shallow area known for shipwrecks that has many reefs but no larger islands to offer boats shelter from pounding waves. Rescue teams with helicopters and boats were sent to evacuate the cruise ship. "The heavy seas probably caused movements in the tanks so large that the supply to the lubricating oil pumps stopped," Alvestad said during a news conference. "This triggered an alarm indicating a low level of lubrication oil, which in turn, shortly thereafter, caused an automatic shutdown of the engines." 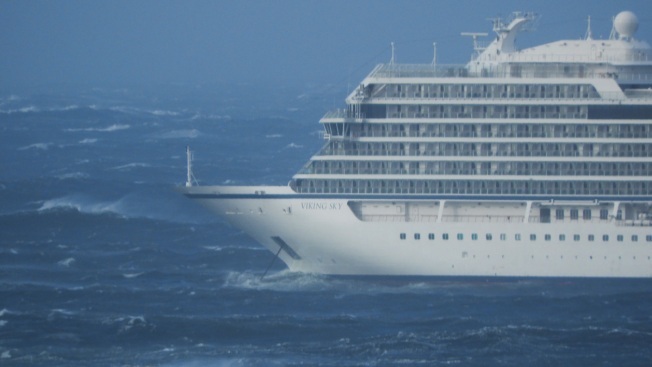 Viking Sky "suffered power 'blackout' in challenging weather conditions," he said. The ship's operator, Viking Ocean Cruises, said it welcomed "the prompt and efficient investigation" of the weekend emergency and accepted the findings. "We have inspected the (oil) levels on all our sister ships and are now revising our procedures to ensure that this issue could not be repeated," the company said in a statement. The Viking Sky ended up in a dangerous situation when the engines stopped Saturday. With the ship carrying 1,373 passengers and crew members rocking violently, the crew sent out a mayday call. Passengers would recall a large wave crashing through glass doors and knocking people across the floor of an area where they were instructed to gather as a muster point. The crew anchored the Viking Sky in a bay as it came close to hitting rocks and the airlift to get passengers off the ship began. Five helicopters winched passengers off one-by-one as winds howled in the dark of night. Waves up to 26-feet- (8-meters-) high were smacking into the ship, ruling out an evacuation by boat. The rescue operation ended Sunday when the engines restarted, after 479 passengers had been airlifted to land. The ship traveled under its own power to a Norwegian port with nearly 900 passengers and crew members remaining onboard. Alvestad said his agency has issued a new safety notice about crews making sure boats have a continuous supply of lubricating oil to engines and other critical systems in poor weather conditions. The Viking Sky was being towed to a shipyard in another port Wednesday for repairs.